Hover over any sleeping bag for more information. Click to go straight to the product page. A lightweight liner that boosts your sleeping bag's warmth by 10°C. 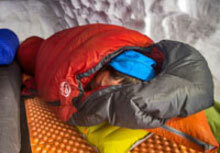 On its own, the lightest of sleeping bags. A PHD 'K Series' product: warmth to weight at the limit of possibilities. Warmth to weight at the limit of possibilities with the upgraded 'K Series' edition of this mountain marathon runners' and extra-keen backpackers' favourite. Minimalist design cuts weight, but not warmth. For lightweight camping, mountain marathons, trekking, or as a backup. Warmth to weight at the limit of possibilities with this 'K Series' version of our classic lightweight bag. Minimalist design cuts weight, but not warmth. Mountain lightweight for cool conditions. Ideal for fast ascents and quick travel. Warmth to weight taken to the limit with our 'K Series' version of this mountain lightweight for cool conditions. Ideal for fast ascents and quick travel. Mountain lightweight for cold conditions. Ideal for fast ascents and quick travel. Warmth to weight taken to the limit with our 'K Series' version of this mountain lightweight for cold conditions. Ideal for fast ascents and quick travel. Minimalist design cuts weight, but not warmth. For winter camping, high treks, or base camps. Mountain lightweight for low temperatures and high peaks. Ideal for fast ascents and quick travel. Warmth to weight taken to the limit with our 'K Series' version of this mountain lightweight for low temperatures and high peaks. Ideal for fast ascents and quick travel. High-specification expedition bag, cut roomy enough for stashing kit and for comfort at altitude. Warmth to weight taken to the limit with our 'K Series' version of this high-specification expedition bag, cut roomy enough for stashing kit and for comfort at altitude. High-altitude and expedition lightweight. Ideal for moving fast in extreme environments. Warmth to weight taken to the limit with our 'K Series' version of this high altitude and expedition lightweight. Ideal for moving fast in extreme environments. Expedition bag for long high-altitude ascents and polar challenges, cut wide enough to accommodate a full set of down clothing. Expedition lightweight. Ideal for cutting loads or for moving fast in extreme environments. Warmth to weight taken to the limit with our 'K Series' version of this expedition lightweight. Ideal for cutting loads or for moving fast in extreme environments. High-specification expedition and polar bag, cut roomy enough for stashing kit and for comfort in extreme environments. Warmth to weight taken to the limit with our 'K Series' version of this high-specification expedition and polar bag, cut roomy enough for stashing kit and for comfort in extreme environments. Expedition bag for long polar challenges, cut wide enough to accommodate a full set of down clothing. Polar lightweight. Ideal for cutting loads or for expeditions that plan on moving fast in extreme conditions. Warmth to weight taken to the limit with our 'K Series' version of this polar lightweight. Ideal for cutting loads or for expeditions that plan on moving fast in extreme conditions. A new generation of active-use bags. Expedition bag, with expansion room.